December, 2016: We want to give a huge thank you to the students and faculty of Forest Hills High School. The Community Service Committee organized a Peach Fuzz Volleyball Tournament during Homecoming. Peach fuzz is where each grade level and the faculty put together an all male team and compete. In case you are wondering, the faculty won!! Each year student council selects a local organization or charity to give the proceeds to, and this year the $279 raised went to Angelic Riders!! December 2016: We have so much to be thankful for! Thank you for all of the holiday donations we have received so far. Southern States recently hosted a feed drive and provided us with 6 bags of feed and a salt block! Claire is a senior at Tabernacle High School and has been doing an outstanding job with our riders, horses and volunteers since she started working with us in June. She aspires to become a certified instructor and make a career of helping others. Learn more about her here. We want to say a big thank you to Master Sergeant Davis and the JROTC group from Monroe High School for coming out and helping us beautify the trails last Saturday. They spent 3 hours raking our entire trail system, approximately one mile. 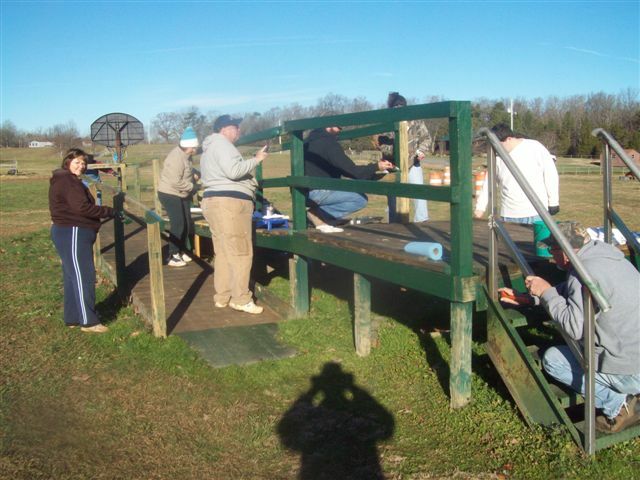 They cleaned nuts, limbs, and leaves that get in the way of the volunteers and the horses. These men from Pleasant Hill Baptist Church gave our office a new paint of stain, just in time for the Walk-a-thon! We are so appreciative of their generosity and commitment to the community. If you are a part of an organization looking to do a service project, send us a message, there is always work to be done around the farm! Thank you Arlington Baptist Church's Directions for Life Sunday school class! 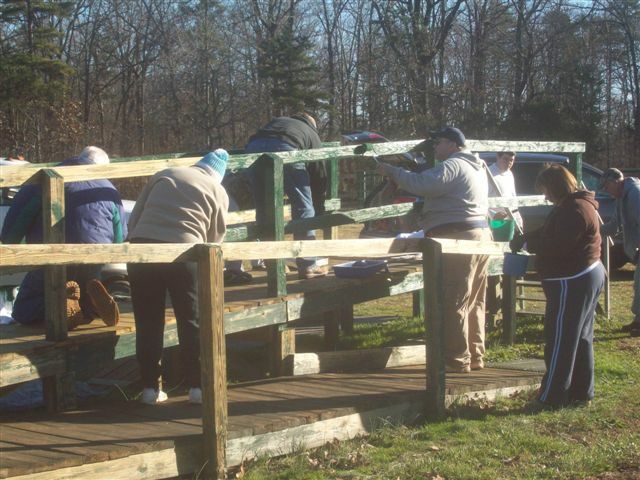 They braved the cold temperatures to give the ramp a much needed painting. The ramp is essential for our riders who use wheelchairs, have physical limitation that make mounting difficult or are too short to mount from the block. We are so grateful to have a community that continually shows us their support and love! The Independence Saddle has arrived and is in use! We are so thankful to everyone who supported our program and riders through this fundraiser. 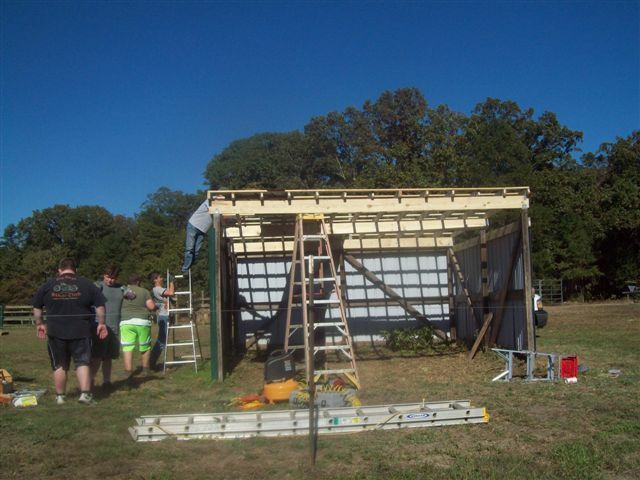 Everyone at Mephibosheth Farm, and especially the horses, would like to thank Eagle Scout Calvin Glaser and his team for the new roof on one of the farm's horse run-in shelters. Helping Calvin earn his Eagle Scout badge were Mason Atkins, Tanner Bales, Garrett Bowen, Brody Buckman, travis Downs, Alex Gaura, Mason Kirkpatrick, Kyle Long, Paul Suggs and Calvin’s dad, Bob Glaser. The goal of $5,695 has been met for the Independence Saddle! This fundraiser began on May 4th at Texas Roadhouse and the goal was reached on October 4th at Mephibosheth Farm’s 11th Annual Walkathon. We had many generous contributors to this very important purchase. The final two came recently. Pleasant Hill Baptist Church, home church of one of our riders James, held a very successful fundraiser of their own which brought in $3337.20 for the Independence Saddle. We would also like thank a very kind generous woman, Lucille Hill, and her family for $1,200 which was donated toward the saddle in Mrs. Hill’s memory. This saddle is so important to our riders with paralysis. It will provide them the proper physical support they need while giving them the freedom to enjoy their therapeutic horseback riding sessions. Thank you to everyone who contributed to this saddle purchase. Mephibosheth Farm is blessed with so many caring supporters. The wonderful work done at the farm wouldn’t be possible without you. You did it again! Thanks to all your hard work we raised $17,237.15 for the Walkathon so far. It continually amazes us what can be accomplished when so many people work together to raise funds for a worthy cause. Thank you to everyone who came together to make the event a success. We are always grateful to the Steeles for their delicious barbecue. This year we were fortunate to have Higher Groove Ministries providing wonderful music. We would also like to thank everyone who provided desserts, other lunch items, all those who gathered items for the silent auction, the businesses who donated the items and all the people who donated their time to make the day run smoothly. We would like to congratulate Kaitlin on winning Most Improved Rider of the Year, Team Grateful on winning Most Raised by a team, Isabella on winning Most Raised by an individual and Nathan for winning Most Contacts! Great Job! We would also like to thank Dave Hill for his consistent work in supporting the farm. 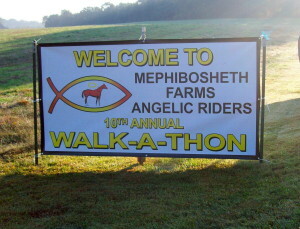 Mephbosheth Farm’s Angelic Riders program welcomes riders with a wide range of disabilities. Riders with disabilities like cerebral palsy and paralysis require proper support to maximize benefits like improved balance, range of motion and body control. The farm needs a saddle to accommodate these riders. The Independence saddle, pictured, provides support without compromising the rider’s freedom. We need your help raising funds to purchase this $5,695 saddle. Will you help? If you are unable to donate financially, you can still assist us by spreading the word. Together we can bring a better quality of life to our riders with physical disabilities. Thank you! God blesses us in so many ways, even in loss, and we have been reminded of that recently with the passing of a beautiful life, that of Lucille Hill. Lucille was a consistent donor to the farm and although she was never able to visit, she was able to see our mission through pictures and a video. In her passing she asked that all memorials be made to the farm and we recently received a $5,000 donation in her name from the memorial in conjunction with a contribution from her son Dave, and his wife Cindy Hill. We are so thankful to all who contributed and to have been a part of Lucille's life. We have recently received another very generous donation of $2,400 in memory of Mrs. Hill. $1,200 was put toward the Independence Saddle Fund and the other $1,200 was put toward the 2014 Walkathon total. We are tremendously grateful to the Hill family for supporting the Angelic Riders while dealing with their loss. We have been so blessed by 2013!! We are especially thankful for Oakland Baptist Men's group members Ray Greene, Larry Helms, Clay Granger and Richard Majewski for volunteering their time and resurfacing our 12 year old wheelchair ramp. The ramp allows us to mount riders in wheelchairs to their horses with ease and is essential for our operation. Thank you all so much for your hard work and to all of you who have graced this special place with your presence this past year, we look forward to another year of miracles and good times here at the farm! The raffle for the 1969 Chevelle has officially ended! James Owens of Waxhaw NC bought the winning ticket, which was drawn by one of our own riders, Landen, who is 6 years old. Award winning Chili was provided at the drawing by Andrew Sweigart, with delicious cornbread by Colin Zimmerman. We are thankful to say that the raffle brought in $6700, covering our payments for the covered riding arena for a whole year! Thank you so much to everyone who participated in the raffle and a special thank you to Robin & Faye Goodman of Southside Auto Sales, 3411 Pageland Hwy, Monroe, NC for providing this wonderful fundraiser, and be sure to call them for your auto needs! Wow, we are so blessed to have such a strong and supportive community. On October 5th 2013, we hosted our 10th annual Walk-a-Thon and it was a beautiful fall day filled with sunshine and amazing people. We hosted around 150 participants in our fundraiser this year and were able to raise $17,621 through donations, a live auction, T-shirt sales and vendor booth rentals. This is the most that we have ever raised at a past walk-a-thon and we are so thankful for everyone that made an effort to participate and donate. This year we hosted GalFriday, a band that we have never had before. They played a mix of bluegrass, country and southern rock that kept everyone entertained, including the horses! Ron and Rita Steele were gracious enough to provide their famous BBQ and fixings again and everyone left with a full tummy! Dave Hill was recognized for Most Money raised by an individual. 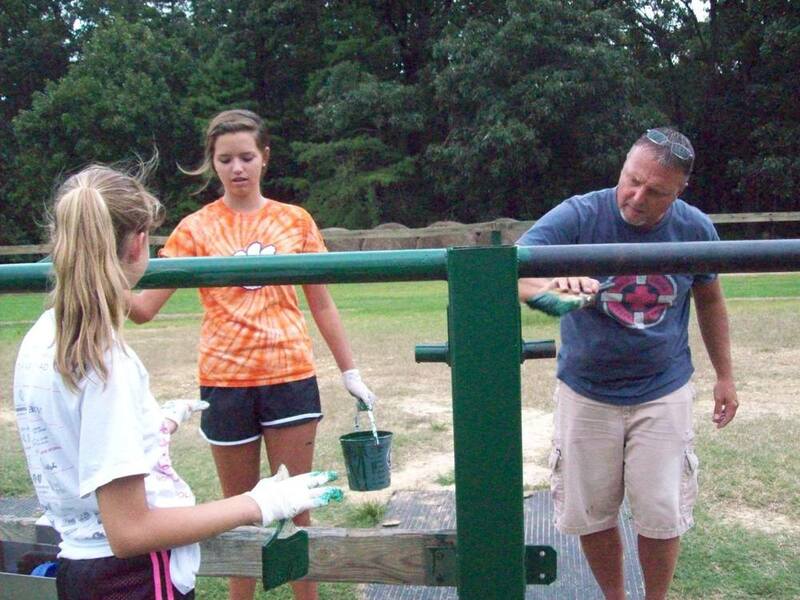 e want to express extreme gratitude on behalf of the riders, volunteers and everyone on the Angelic Riders team to the Pleasant Hill Baptist Church youth group who came out Wednesday evening and repainted the cargo trailer, corral and many of the gates. They look absolutely amazing! We are so thankful for all their hard work and for their generous donation of paint, brushes, buckets and, most of all, time. It was truly a sight to see when the bus pulled up and people spilled out before getting right to work. Many hands make light work indeed! Seeing the trailer quickly go from being almost white to a brilliant shiny green in a matter of moments was incredible. The enthusiasm of everyone involved was awesome and made the whole project a great success!